Game Boy was an 8-bit handheld video game device with interchangeable cartridges developed and manufactured by Nintendo, which was first released in Japan on April 21, 1989, in North America on July 31, 1989 and in Europe on September 28, 1990. It is the first handheld console in the Game Boy line and was created by Satoru Okada and Nintendo Research & Development 1. This same team, led by Gunpei Yokoi at the time, is credited with designing the Game & Watch series as well as several popular games for the Nintendo Entertainment System. Redesigned versions were released in 1996 and 1998 in the form of Game Boy Pocket and Game Boy Light (Japan only), respectively. The Game Boy was Nintendo's second handheld system following the Game & Watch series introduced in 1980 and it combined features from both the Nintendo Entertainment System and Game & Watch. It was either bought as a standalone unit or bundled with the puzzle game Tetris. During its early lifetime, the Game Boy mainly competed with Sega's Game Gear, Atari's Lynx, and NEC's TurboExpress. The Game Boy beat its rivals and became a tremendous success. The Game Boy and its successor, the Game Boy Color, have sold over 118 million units worldwide. 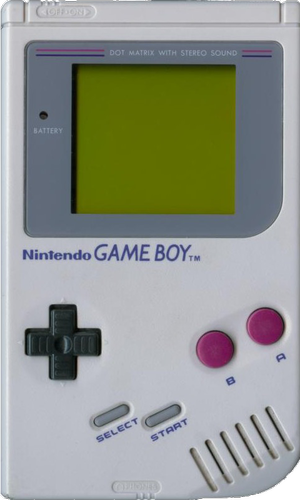 Upon the Game Boy's release in the United States, it sold its entire shipment of one million units within a few weeks. The Game Boy and Game Boy Color were discontinued in the early 2000's in favor of the subsequent Game Boy Advance, released in 2001. The Game Boy has four operation buttons labeled 'A', 'B', 'SELECT', and 'START', as well as a directional pad. There is a volume control dial on the right side of the device and a similar knob on the left side to adjust the contrast. At the top of the Game Boy, a sliding on-off switch and the slot for the Game Boy cartridges are located. The on-off switch includes a physical lockout to prevent users from either inserting or removing a cartridge while the unit is switched on. Nintendo recommends users leave a cartridge in the slot to prevent dust and dirt from entering the system. The Game Boy also contains optional input and/or output connectors. On the left side of the system is an external 3.5mm x 1.35mm DC power supply jack that allows users to use an external rechargeable battery pack or AC adapter (sold separately) instead of four AA batteries. The Game Boy requires 6 V DC of at least 150 mA. A 3.5 mm stereo headphone jack is located on the bottom side of the unit which allows users to listen to the audio with the bundled headphones or external speakers. Handheld gaming console Nintendo Game Boy.